The White Sox-Cubs Rivalry. A Chicago Tradition. 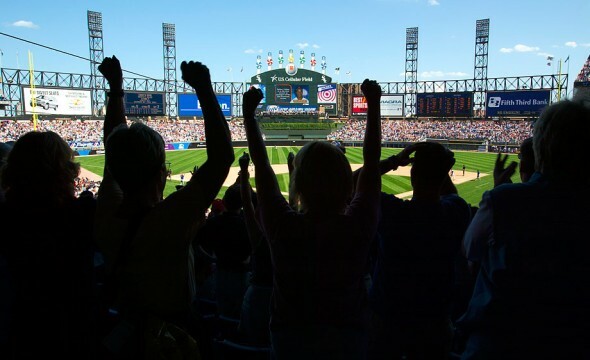 Northside versus Southside, dogs versus cats, Hatfields versus the McCoys, Senior Circuit versus Junior Circuit, call it what you want as Chicago’s baseball bragging rights are put on the line when the White Sox and Cubs tangle for six games of interleague action every summer. Orlando Cabrera completes a double play over a sliding Daryle Ward in 2008. Even though the fans and media play up the rivalry, the players generally dismiss the added hoopla and usually take the “it’s just another series” approach. I think that’s a safe way to handle things, since providing potential clubhouse bulletin board fodder isn’t generally a good idea. 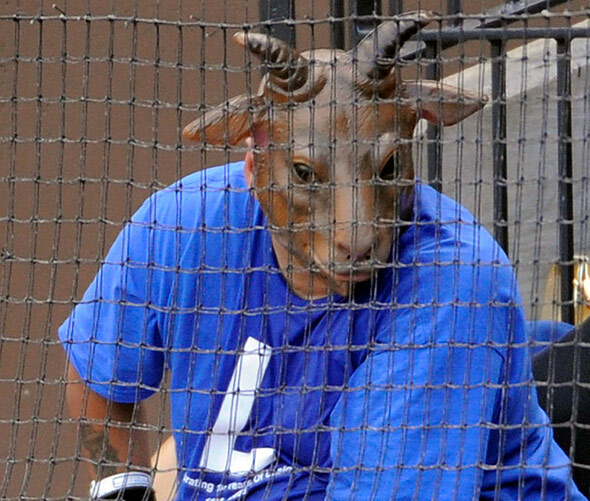 But my guess is that because the fans and media do make a big deal out of the annual match up, the players are a bit more amped up than normal come game time. There is always a playoff like atmosphere in the air. 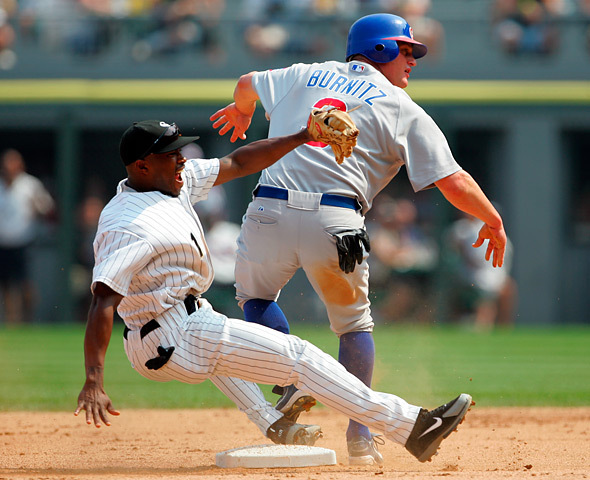 Willie Harris of the White Sox reacts after Jeromy Burntiz spikes Harris during a 2005 game at U.S. Cellular Field. Since interleague play began in 1997, these games are played for more than just bragging rights, a far cry from the old “Crosstown Classic” that was held between the two clubs during the weekend prior to the start of the season. Probably one of the more memorable moments from the old version of “The Classic” was Michael Jordan’s baseball debut in Chicago. This year the teams are playing for the Crosstown Cup, a traveling trophy awarded to the overall winner each year. The Astros and Rangers play for the Silver Boot, the Reds and Indians for the Ohio Cup, and now the White Sox and Cubs for the Crosstown Cup. Very cool. Everything seems magnified during these two weekend series. For me, it’s all about fun! Even the team photographers get into the spirit of things. 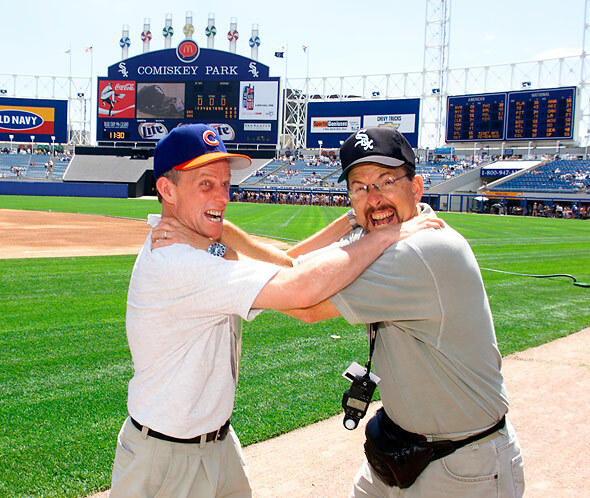 Long time Chicago Cubs team photographer Stephen Green and yours truly mix it up prior to a 2000 White Sox/Cubs match-up at Comiskey Park. There have been more than a few memorable moments that have come out of this annual inner-city, interleague battle. Probably the most memorable to date is the infamous Michael Barrett/A.J. 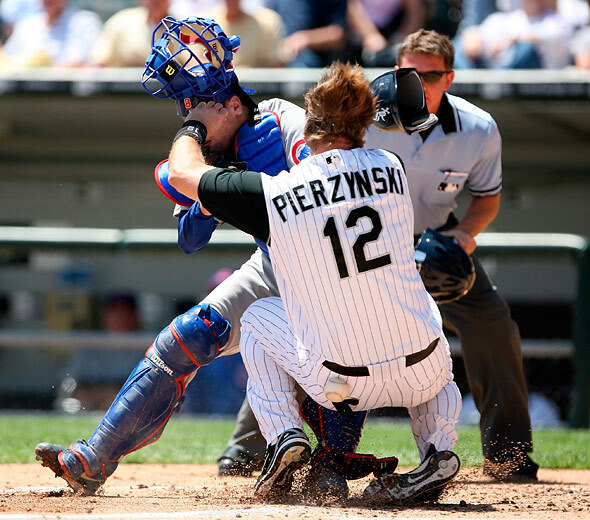 Pierzynski play at the plate and ensuing brawl at U.S. Cellular Field from 2006. It started out as a helluva great play at the plate, and took off from there. Another memorable play that comes to mind was a home plate collision between Gary Matthews Jr. of the Cubs and Sandy Alomar Jr. of the White Sox. Matthew’s upended Alomar, but Sandy held on to the ball to record an emotional out during a 2001 match up. Who say’s the intensity level isn’t there when these two teams meet? Remember when Antonio Osuna became just a little excited when he struck out Sammy Sosa to end the game and earn a save on June 29, 2002? Just another game? White Sox/Cubs games are always one of the toughest tickets to come by each summer, and that said, all sellouts. Nothing like baseball being played in front of a lively, loud full house. I love it from a photographers standpoint, it must feel great from a ballplayers perspective. 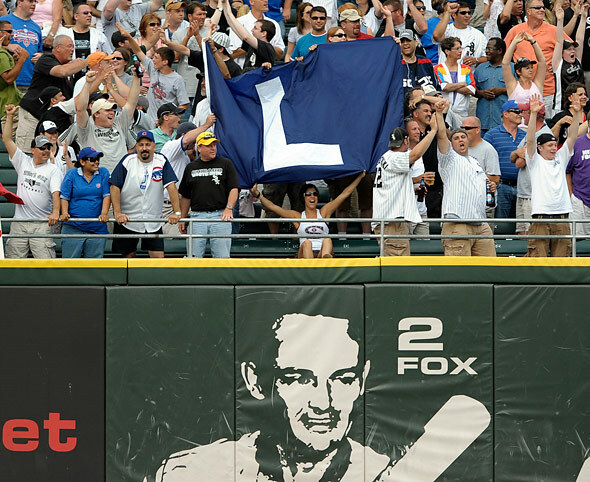 I hate to admit it, but this is a shot of Cub fans celebrating at U.S. Cellular Field after the Cubs tied the game with two out in the ninth inning. It was supposed to have a different ending, but the resulting image still worked! Then there are the fans. You never know who or what you might see. It’s a festive atmosphere at both ballparks. I can’t wait to see what’s in store this year, and it all starts later this week at Wrigley Field. Let the games begin! This entry was posted on Wednesday, June 9th, 2010 at 9:58 AM	and is filed under Chicago White Sox. You can follow any responses to this entry through the RSS 2.0 feed. Well, two out of three this weekend at Wrigley for the White Sox, with a pair of near no-hitters tossed in on the finale on Sunday! I can’t wait till the weekend of June 25-27th for round two!